Samsung is planning to launch a new set of Galaxy A series mid-range smartphones in the first quarter of 2019. The series will include some of the upcoming smartphones like – Galaxy A10, Galaxy A30 and Galaxy A50. Out of these three smartphones, Samsung Galaxy A50 will be the higher end model with flagship-like features. 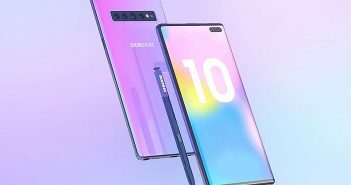 Later on in the year, Samsung will also launch its Galaxy A70 and Galaxy A90 smartphones. Recently, some of the confirmed specifications of these three upcoming smartphones appeared online. Moreover, all the smartphones are expected to make their debut sometime during March. As of now, the price and the launch date of these smartphones have not been confirmed. But, we can expect mid-range to affordable price tags on these smartphones. 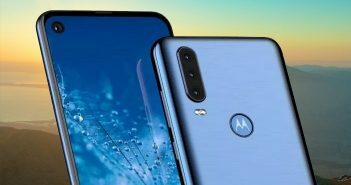 According to the image, the smartphone will come with a 6.4-inch Full HD+ display with a screen resolution of 1080 x 2340 pixels and an aspect ratio of 19.5:9. Additionally, instead of bezel less display mobile phones, the display will sport an Infinity-U notch which will house the front camera. On the rear panel, the smartphone is seen with a triple camera setup. The camera setup will include a 25-megapixel primary sensor with f/1.7 aperture, a 5-megapixel depth sensor with f/2.2 aperture and an 8-megapixel ultra-wide sensor with f/2.4 aperture. 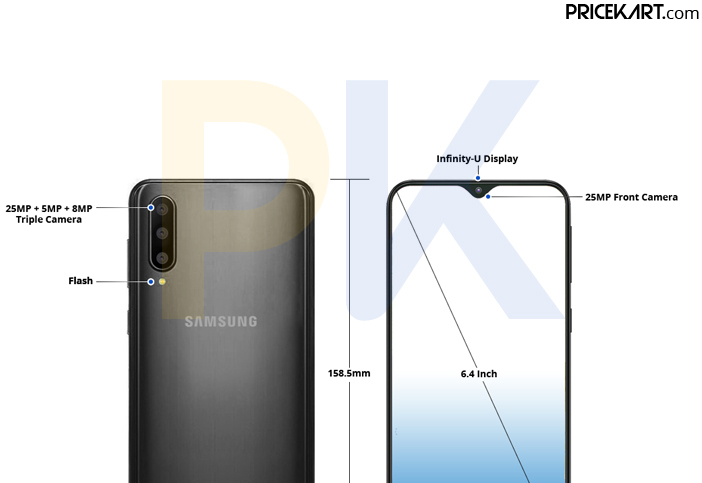 Similarly, the image of the front panel reveals that the Samsung Galaxy A50 smartphone houses a 25-megapixel camera with f/2.2 aperture. 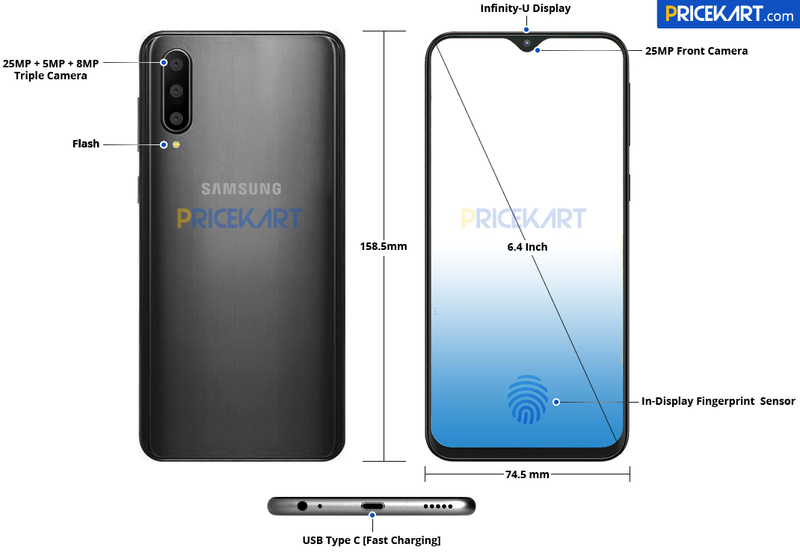 As there is no fingerprint sensor visible on the front or the rear panel, we can expect the Galaxy A50 to be one of the in display fingerprint sensor mobile phones. Under the hood, the device will be powered by an octa-core Exynos 9610 SoC. 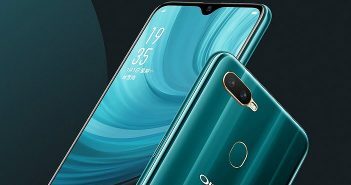 On the storage end, this smartphone will be available in 4GB RAM and 6GB RAM variants coupled with 64GB and 128G internal storage respectively. Furthermore, the smartphone will run on the latest Android 9 Pie operating system. And, it will be fuelled with a 4000mAh battery. Interestingly, Galaxy A50 will be one of the quick charging mobile phones to support fast charging of 15W. Lastly, the phone will launch in Black, White and Blue colour variants.